This quality Rexel Jiffex transfer file is made from premium quality 270gsm manilla and features a 32mm capacity mechanism with a compressor bar to help keep contents flat. Ideal for filing punched A4 and foolscap reports, projects and more. The file also features a pre-printed labelling area for quick identification of contents. 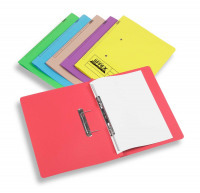 Ideal for colour coordinated filing, this pack contains 50 yellow foolscap files.